Hectic summer days are almost here! Between baseball games, swim lessons, and fun-filled weekends, who has hours to spend in the kitchen? 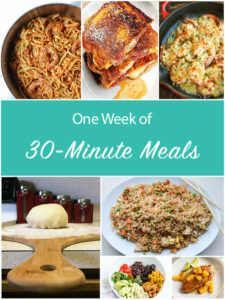 Here are seven 30-minute meals to last you the week—time tested by yours truly and my impatient toddler, which means they are truly, actually ready in 30 minutes or less. These are recipes the whole family will beg you to make again and again. The skeptics out there who say that fried rice doesn’t make a whole meal almost certainly haven’t tried this recipe. 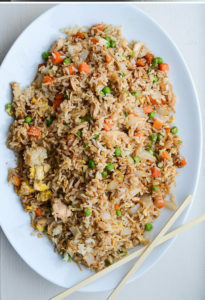 With a little chicken (fresh, frozen, or even this teriyaki crockpot recipe) or tofu this fried rice will quickly become a go-to meal. Tip: This dish is best if made with day-old rice, so I often double the rice from another dish so I’ll have leftovers ready in the fridge. I know. Don’t roll your eyes yet—this isn’t your average recipe. This 100% made from scratch crust will rival any California Pizza Kitchen, or any other local restaurant, for that matter. It’s easy to double (but don’t double the yeast!) or make ahead. The best part? The “active kitchen” time it takes to make—so not counting rise time—is limited to a mere 15-20 minutes. Really. You won’t regret it. 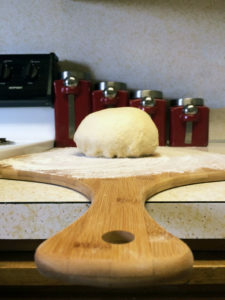 Tip: 00 flour can be difficult to find (and pricy), but any bread flour makes an excellent substitute. 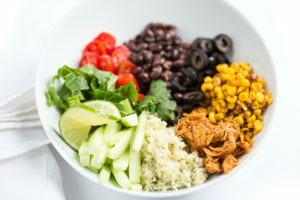 Rice bowls offer endless variation, which makes it easy to please even your pickiest eater. The hardest part is chopping the veggies and keeping your protein (most often chicken, tofu, or steak) simple—both of which are easy to do with this favorite recipe. Tip. If cauliflower rice isn’t your thing, this recipes is just as delicious with white or brown rice. 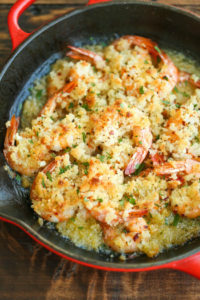 This shrimp scampi is an impressive dish that nobody will guess took just 20 minutes to throw together. It can be eaten by itself or with rice or linguini, and pairs great with steamed broccoli. Tip: For those of you who are carb-conscious, serve the shrimp on top of zucchini noodles for a healthier option. We’ve all had hectic nights where we slap a grilled cheese sandwich together and call it dinner. But as long as we’re talking sandwiches, why not make it decadent? 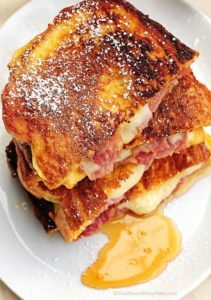 If you’ve never had a monte cristo sandwich, be prepared to be wowed. They can be made with any good melting cheese and ham and/or turkey are the traditional fillings (which makes these perfect for leftovers!). Tip: Try adding cranberry sauce or preserves for a popular twist! Any 30-minute meal list wouldn’t be complete without pasta. This fresh-tasting dish will keep you coming back for more! 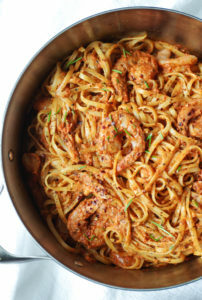 This recipe uses shrimp, but it could easily be substituted for chicken breast or omitted for a vegetarian version. Tip: Like a creamy sauce? Try adding about ¼ cup of alfredo or heavy cream. 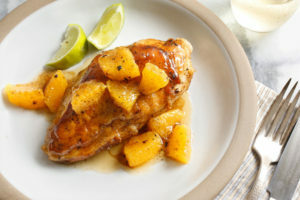 Mark Bittman offers an easy, unique way to prepare chicken breast. The sweet and tangy flavor is sure to be a hit! Tip: Slice the chicken on top of rice with steamed asparagus for a delicious stir fry! The Poached Trophy Deer that Received a PROMOTION!